An event like no other, the 2018 Great Futures Gala is a fun night out in support of the mission of the Boys & Girls Club. This year we are thrilled to announce former Seahawk, Steve Largent, as our featured speaker for the evening. Come enjoy the games, silent auction, dinner, drinks, and for VIP sponsors, an exclusive photo op. Tickets and sponsorships are now available. Last year, the event sold out, even with expanded seating having been made available. Don’t miss out on your opportunity to have dinner with a legend! Located at Corporate Air Center (15452 Airport Drive., Burlington, WA 98233). For more info contact Ian Faley at 360-419-3723 x7 or ifaley@skagitclubs.org. The Seahawks’ first pro-Bowler, Largent grew up in the Boys & Girls Club, and after the NFL, went on to a career in Congress. Nearly cut by the Houston Oilers after four preseason games, Steve Largent was traded to the expansion Seattle Seahawks for a 1977 eighth-round pick, instead. He would be the first Seahawk selected to the Pro Bowl, and when he retired, he held all major NFL receiving records. Not bad for someone who nearly saw their professional career cut short. Steve Largent was inducted into the Pro Football Hall of Fame in 1995, his first year of eligibility. Long before he would be donning the Seahawks’ Blue, he was a Boys & Girls Club member, and the Boys & Girls Clubs of Skagit County is honored to welcome him this fall as the speaker for our 2nd Annual Great Futures Gala. 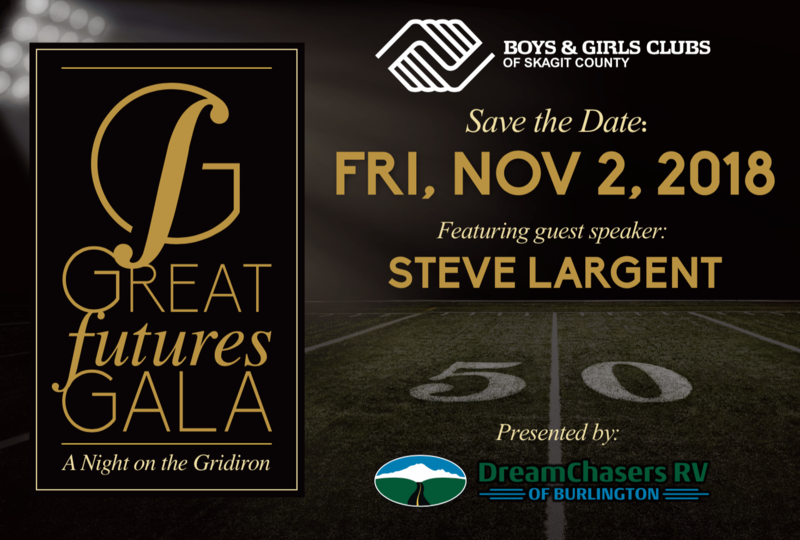 This year’s Gala promises to be a wonderful night of philanthropy, and we hope that you are as excited as we are about welcoming Steve Largent to Skagit County to share about his own experiences in the Boys & Girls Clubs. As an alum, he has a keen perspective as to the value and impact of the mission: to enable all young people, especially those who need us most, to reach their full potential as productive, caring, responsible citizens. Even with increased seating for 2018, we anticipate another sold-out year. Don’t delay in joining the Sponsorship Huddle, and as always, thank you for considering an investment in Skagit County kids and teens.